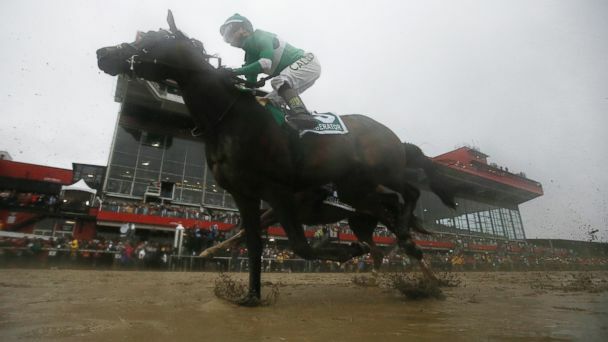 Exaggerator pulled away from Nyquist down the stretch to win the Preakness States, dashing the previously undefeated Kentucky Derby winner's bid for the triple crown. Exaggerator took the lead at the top of the stretch and bolted through the mud to a 3 1/2-length victory over Cherry Wine. Nyquist, the 3-5 favorite in the 11-horse field, and dueled with Uncle Lino for the lead through the first mile of the 1 3/16th-mile second leg of the Triple Crown, but seemed to tire at the end. He finished third, followed by Stradivari, Lani, Laoban, Uncle Lino, Fellowship, Awesome Speed, Collected and Abiding Star. What should have been a festive beginning to the day was marred by two horses' deaths and a jockey's injury. First racehorse Homeboykris collapsed while walking back to his barn after winning a race, according to Sal Sinatra, the president and general manager of the Maryland Jockey Club. Later, racehorse Pramedya fractured her left cannon bone while racing, and Pramedya's Jockey, Daniel Centeno, fell and suffered a right clavicle fracture, according to Sinatra. Pramedya was euthanized on the track, according to The Associated Press.